ESO’s FORS2 instrument captures stunning details of spiral galaxy NGC 3981. FORS2, an instrument mounted on ESO’s Very Large Telescope, has observed the spiral galaxy NGC 3981 in all its glory. The image was captured as part of the ESO Cosmic Gems Programme, which makes use of the rare occasions when observing conditions are not suitable for gathering scientific data. Instead of sitting idle, the ESO Cosmic Gems Programme allows ESO’s telescopes to be used to capture visually stunning images of the southern skies. This wonderful image shows the resplendent spiral galaxy NGC 3981 suspended in the inky blackness of space. This galaxy, which lies in the constellation of Crater (the Cup), was imaged in May 2018 using the FOcal Reducer and low dispersion Spectrograph 2 (FORS2) instrument on ESO’s Very Large Telescope (VLT). FORS2 is mounted on Unit Telescope 1 (Antu) of the VLT at ESO’s Paranal Observatory in Chile. Amongst the host of cutting-edge instruments mounted on the four Unit Telescopes of the VLT, FORS2 stands apart due to its extreme versatility. This ”Swiss Army knife” of an instrument is able to study a variety of astronomical objects in many different ways — as well as being capable of producing beautiful images like this one. The sensitive gaze of FORS2 revealed NGC 3981’s spiral arms, strewn with vast streams of dust and star-forming regions, and a prominent disc of hot young stars. The galaxy is inclined towards Earth, allowing astronomers to peer right into the heart of this galaxy and observe its bright centre, a highly energetic region containing a supermassive black hole. 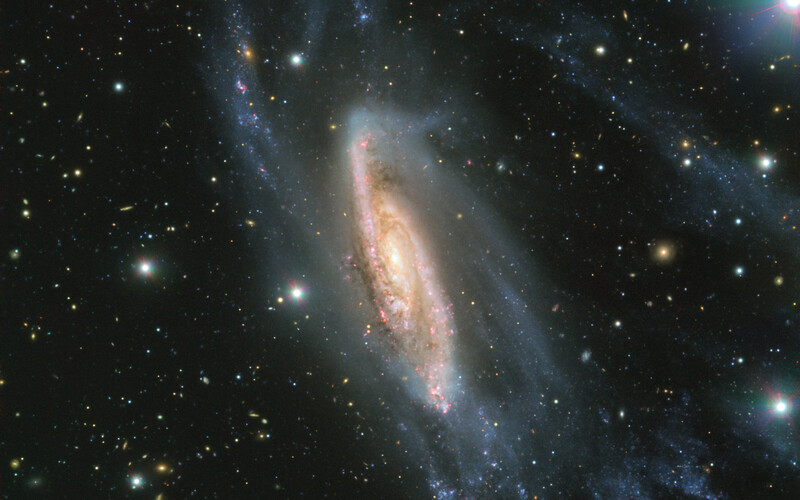 Also shown is NGC 3981’s outlying spiral structure, some of which appears to have been stretched outwards from the galaxy, presumably due to the gravitational influence of a past galactic encounter. NGC 3981 certainly has many galactic neighbours. Lying approximately 65 million light years from Earth, the galaxy is part of the NGC 4038 group, which also contains the well-known interacting Antennae Galaxies. This group is part of the larger Crater Cloud, which is itself a smaller component of the Virgo Supercluster, the titanic collection of galaxies that hosts our own Milky Way galaxy. NGC 3981 is not the only interesting feature captured in this image. As well as several foreground stars from our own galaxy, the Milky Way, FORS2 also captured a rogue asteroid streaking across the sky, visible as the faint line towards the top of the image. This particular asteroid has unwittingly illustrated the process used to create astronomical images, with the three different exposures making up this image displayed in the blue, green and red sections of the asteroid’s path. This image was taken as part of ESO’s Cosmic Gems programme, an outreach initiative to produce images of interesting, intriguing or visually attractive objects using ESO telescopes, for the purposes of education and public outreach. The programme makes use of telescope time that cannot be used for science observations. In case the data collected could be useful for future scientific purposes, these observations are saved and made available to astronomers through ESO’s science archive.